I don’t know about you, but my school has been living and breathing the common core over the last few weeks. Although as a private school, we are exempt from the 3-8th grade testing requirement, my school administered the tests anyway to help provide benchmarks for the General Studies program. So we lived through the state exams. Our students did really well, and I got to feel good that I’m not the only one who has trouble making assessments that capture the vibrancy of the curriculum. An important lesson. But, even more important, I learned that there are some great techniques and research being used to teach the Common Core that we should make our own in Judaic Studies. A major part of the common core is a focus on teaching academic vocabulary from grades K-12.Research has shown that students who are academically successful have broader and deeper academic vocabularies. And while students who read more often have better academic vocabularies, forcing students to read more won’t increase their vocabulary. We need a system to teach vocabulary if we want all our students to be able to learn and read. As a result, the 6th shift for the ELA standards is toward vocabulary learning. Teachers from K-12 are now focusing on teaching vocabulary and developing systems to do so. They are teaching academic vocabulary in all subject areas to make sure that students can read the required texts in each discipline. But I teach Ivrit B’Ivrit, or Mishna do I need to worry about Academic Vocabulary? The answer is a resounding yes. No matter the language of instruction, all students need to be learning vocabulary. If students don’t understand over 90% of what they read, they are not reading for meaning. They won’t learn the language just by reading words in context. Biblical Hebrew, Mishnaic Hebrew, and the Hebrew of the commentaries differ from modern and spoken Hebrew. The different idioms and grammars must be taught explicitly. So, if you teach Ivrit B’Ivrit, or advanced Chumash in high school, you can still benefit from the information I’m about to present. Modify your exercises so they resemble the vocabulary instruction done in the General Studies classroom but please still do them. What is the Academic Vocabulary in Judaics? During Chumash, the high frequency words and the common grammar forms are the academic vocabulary. In later grades, new words and grammar constructs would be the academic vocabulary. Gemara, has key words that indicate logic and text structures. Plus, of course, Aramaic is its own academic vocabulary with new grammar, high frequency words and other common words. Rashi: The hebrew of Rashi is different than Biblical Hebrew. There are idioms that convey meaning such as the shoresh א.מ.ר means a quote, אֶלָא, וּמִדְרָשוֹ, etc. Other Meforshim: The Ramban, Ibn Ezra etc all use vocabulary specific to their time. Their structure is also dense and needs to be unpacked. Students need to be guided in how to unpack and read these very academic texts. Vocabulary instruction must be systematic and explicit to work. Robert J. Marzano, in his book Building Academic Vocabulary outlines 6 steps to help students learn vocabulary. While each of these steps can be used individually, they are most powerful when used in sequence and together. Step 1: Teacher will give a description, explanation, or example of the new term. Step 2: Linguistic: Students will restate the description, explanation, or example in their own words. 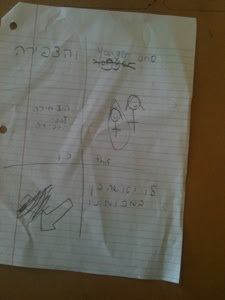 tep 3: Non-linguistic: Students will draw a picture, symbol, or locate a graphic to represent the new term. Step 4: Students will will participate in activities that provide more knowledge of the words in their vocabulary notebooks. Step 5: The learner will discuss the term with other learners. Step 6: The learner will participate in games that provide more reinforcement of the new term. On to vocabulary instruction . . . .
First, describe the term. Act it out. Draw it on the board. Tell students a story with the word. Just giving a definition isn’t helpful because that’s not how we learn language. Use both verbal and non-verbal communication to explain the term to help the learning and to prepare the students for the next step.I have pictures I use for each shoresh, I draw on the board and I do charades for many terms. This makes it fun and helps the students learn the new words in the most natural way possible. Step 2: Students restate description, explanation, or example of the new term in their words. I have the students write the definition in their learning log which is very useful. In this example, I was able to spot the spelling mistake and correct the error. Step 3: Students will draw a picture, symbol, or locate a graphic to represent the new term. Drawing pictures and symbols forces the student to process the information in a different way. For some, this is the way they love to learn, and they brighten up after being forced to read, read, read. They finally get to doodle! Other students find this very challenging and need help to come up with their own pictures especially for abstract ideas. After a while, they get it, and they enjoy a chance to use their creativity. I also have students draw their own picture in their learning log. Step 4: Students will participate in activities that provide more knowledge of the words in their vocabulary notebooks. In this step, the students use the words in context and out of context. Have them look for prefixes, and suffixes and roots. Record antonyms and synonyms. In Chumash class, I ask the students to locate the shoresh in the pasuk and write the phrase in their log (see above image). When possible, I ask them to translate the phrase. At the beginning of the year, I had them highlight the prefixes and suffixes using different colored highlighters for עבר, הווה and עתיד. Now, this step is unnecessary and we review this information verbally.Some other ideas: ask students to list שרשים that are synonyms or antonyms or ask them if they have seen this word in other contexts: תפילה, previous פרשיות etc. This is very exciting for students when they remember pesukim they learned in the beginning of the year and they connect their learning to previous learning. When students interact with others their learning is deeper and more memorable. I have my students explain their drawings to their friends, have chavrusas while reviewing the pesukim and describe when they may have experienced the terms in their life or use the term in a conversation with the partner. Marzano has found that games motivate the students to learn and forces them to use the new terms in context and out of context and with friends.I have a word wall in my classroom that changes for each perek. It was very inexpensive to create. I put up large pieces of felt that I bought at a craft store, and bought 1000 velcro hook dots and stuck them to the back of all my laminated vocabulary word cards. Now I can use the cards for many different games and activities to help reinforce the learning and to keep track where each student is holding. One of my students favorite games is “airplane”. They line their seats up into airplane style rows in front of the felt boards. I give the students tickets, 3 green, 3 orange, and 3 yellow. Each row get to take a trip to the board. Each students takes down a word from the board that matches a ticket in their hand and translate the words. If they get the translation right, they put their name on the ticket and it goes into a raffle. Otherwise, I get the ticket. 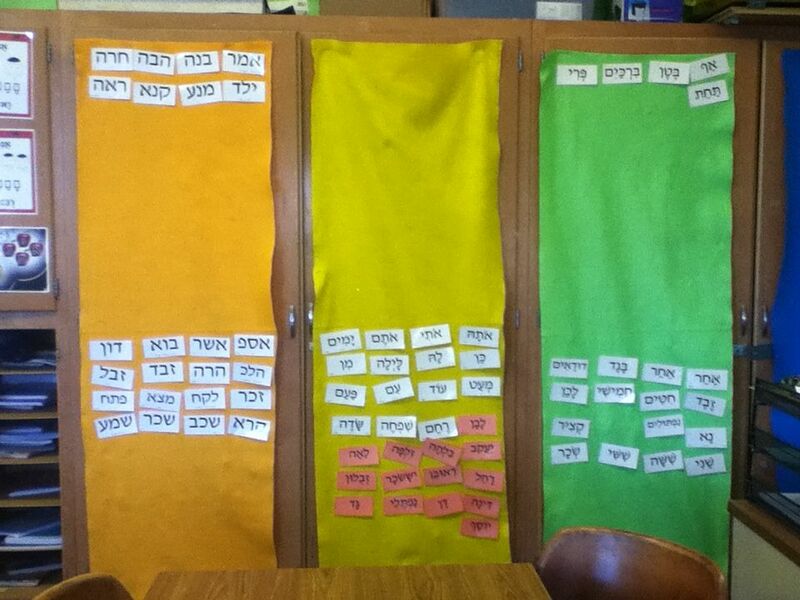 Generally, Orange is shorashim, Yellow is high frequency words and Green is new vocabulary. Everyone has a chance to be successful and reviews all their vocabulary multiple times. I look forward to hearing how you teach vocabulary in your classrooms and any games you may play! http://innovativocab.wikispaces.com/ – A Collection of Technology Resources to help create a new vision of Vocabulary Instruction! Game boards online: PowerPoint Games, Word Game Boards, Excel Games, WORDO, Twister, Fly Swat.